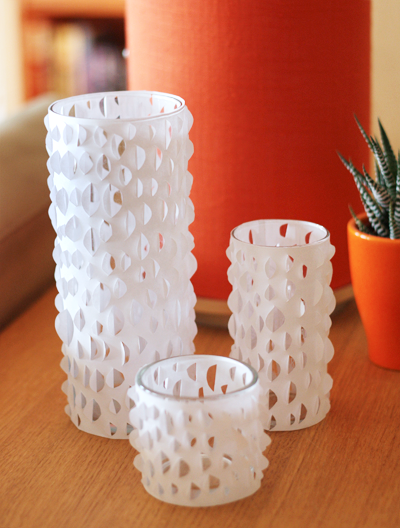 I experimented with cutting some paper the other night and made these bumpy candle holder wraps. I trimmed some sheets of computer paper to sizes that would fit around the glass containers I have. Then with an X-acto knife, I cut a billion different-sized U shapes into the paper and bent the little flaps over so they stuck out. Double-stick tape secured the wraps. Kind of an interesting texture. Gosh, that looks like a lot of work! But well worth the effort! Cool!! It goes pretty fast. Unless you get engrossed in your TV show and forget to keep cutting. I like these a lot! I think with black or orange construction paper these could be spooky for Halloween, too. Thanks! That is so cute and looks a super-easy project. Thanks for sharing. so simple, yet so beautiful! i may have to try that out! Those are really neat! Boy, you must be loving life as Tangerine is THE hot color this year! Love this idea! I'm going to try it with frosted vellum paper. Have an important dinner to throw soon, and spent most of the budget on the food, so these will make inexpensive and cool table decorations that I can give away at the event! thanks for the idea! I love this idea - bet it would look awesome with paper that was silver on the inside (so the light bounces off the folded back flaps). Think I have to try this. How fun and so simple! Looks like a fun and simple project. Really nice, so easy and "only" with normal paper! What a fun idea! I bet it'd also look great for a pillow if you layered a wool felt over a contrast fabric for the peekaboo sections. They look really cool! Thank you for posting these crafting ideas, I love diys that don't require much money. Very easy to do on my Silhouette digital cutter! 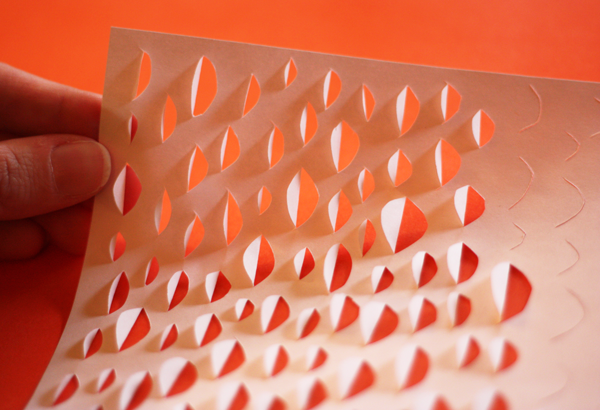 Make one u shape, tell it to fill the page, then cut! Done is just a couple of minutes. May hands would never stand up to using a knife anymore. 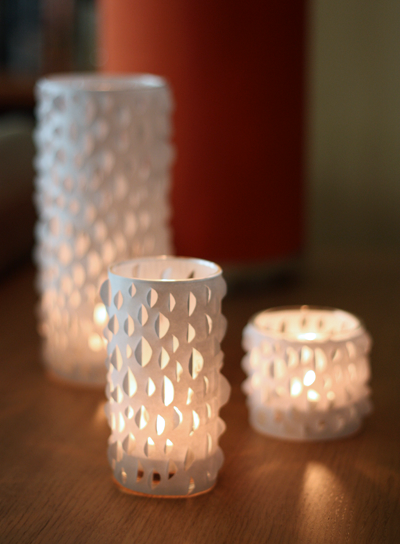 these paper cutting is very beautiful, but as a wife of a fire fighter paper and candles don't go together. I would use the battery lights instead of a votive. Most of the calls my husband went on were started by candles. Thank you for sharing my favorite kind of project: one that's both easy and has a big impact. I shared your DIY on my Facebook page because I think DIY brides will find this handy, too. If you are going to do a lot of these, you can buy a "U" shaped wood lathe tool and then just punch the -shape on a self-healing cutting board. If you use a rubber-mallet to hit the head of the punch it goes so fast. You can even do multiples sheets at one time. I love it. I can't wait to try it. this is so cute! i like if you use different colour or pattern paper it will look really nice too. do u have any recommendations to what other pattern to cut out? Great use of an electronic die cutting machine like my KNK Zing or KNK XL! :-) Great idea! Thanks for sharing! PS I love your blog, it's one of my favorites!